Haelin is a poor province dominated by the ever-present horror of the Bahgdair Swamp. The province's new noble, Duke Rassos, seeks to find a grand treasure, lost decades ago. A rich prize, a noble patron, and an adventure; what more could any person want? There is, however, an obstacle to this glorious future. The Bahgdair Swamp is a lush and verdant hellhole that has claimed many victims over the years. Swampfolk and bizarre monsters lurk in the fetid waters and sodden spits of ground. Hidden in the heart of the swamp a force grows to an unstoppable might. Can the adventurers save their hard won victories and crush this gathering of evil? The fate of the lands of Haelin, and Duke Rassos, lie in the balance. 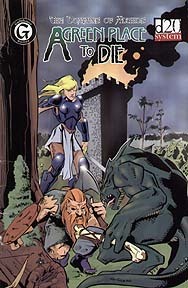 A Green Place to Die is an introductory adventure for the d20 System for characters 1st-3rd level.